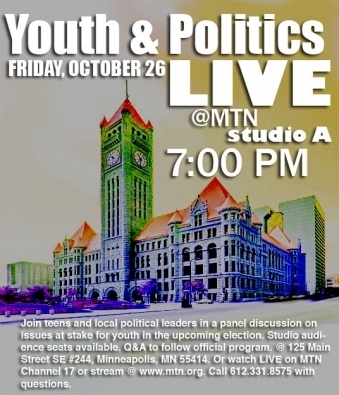 MTN will be hosting a LIVE Youth & Politics panel discussion on Friday, October 26 from 7-8 pm. The panel will be held at MTN’s Studio A (125 Main Street SE #244, Minneapolis, MN 55414) and will air live on MTN’s Channel 17 and will also be available for streaming online at http://mtn.org/Video/tvguide/live.html. Youth and community members are invited to join us in Studio A as part of the studio audience and will have the opportunity to engage directly in the discussion via a Q & A for the final segment of the show. The panel will consist of both teens and adults, giving youth direct access to our community officials and political leaders on a public platform. The panel will focus on the issues at stake for youth in the upcoming elections, barriers to youth participation in democracy, and what youth envision as the future of our political system. It is a venue for teens to identify and discuss issues that they and other teens care about, to share their views and concerns with public officials, and to partake in our local political discourse as active and engaged citizens.